submission on WHO’s Commission on NCDs..
DG SANTE and the Commission’s Joint Research Centre are seeking to select public health best practices i.e. practical interventions that have shown to work at local, regional or national level, that can be transferred between Member States or scaled-up and are conducive to reaching Sustainable Development Goal 3.4. Stakeholders are invited to submit evaluated practices through the best practice portal until 31 January 2019. All practices submitted by this date will be assessed in spring 2019. The owners of the practices selected as “best” would be invited to a “marketplace” workshop with Member States representatives to present their practice (planned for June 2019). It is foreseen that all practices selected as “best” receive a certificate of recognition and are published on the best practice portal. This initiative aims to present an integrated EU approach to combat deforestation, protect forests and promote sustainable supply chains. Deforestation is a major global problem, leading to biodiversity loss, climate change and poverty. The causes are many and complex, though increased production of commodities such as soy, beef, palm oil, coffee, and cocoa drives almost 80% of all deforestation. Roadmaps are open for feedback for 4 weeks. Feedback will be taken into account for further development and fine tuning of the initiative. The Commission will summarise the input received in a synopsis report explaining how the input will be taken on board and, if applicable, why certain suggestions can’t be taken up. Feedback received will be published on this site and therefore must adhere to the feedback rules. The European Court of Auditors, the EU’s independent auditor, is reviewing how the European Commission services, the auditee, consult stakeholders and the Commissions framework for public consultations. They are examining a sample of the Commissions public consultations. In this context, the European Court of Auditors would like to know how citizens perceive public consultations as well as their opinions and suggestions for improvement. For this reason, the auditors have prepared a survey, which will be technically handled by the European Commission. This consultation seeks feedback on proposals for the regulations needed to make sure that nutrition law in the UK would continue to work effectively after the UK has left the EU. The proposals set out would only come into effect if the UK left the EU with no deal. The Committee agreed to reinsert the last sentence in this section relating to the prohibition on the use of nutrition and health It was noted that even though prohibitions on the use of nutrition and health claims were covered in section 1.4 of the Guidelines for Use of Nutrition and Health Claims (CXG 23 – 1997), it was necessary to emphasize the prohibitions for follow-up formula for older infants, which was also consistent with the Standard for Infant Formula and Formulas for Special Medical Purposes Intended for Infants (CXS 72 – 1981). One observer called for the inclusion of the word “independent” in 9.6.1 (c). There was discussion regarding 6.1(d) with the resultant agreed text referring to “not leading to cessation of continued breastfeeding” rather than referring to “not replacing breastmilk” as this concept was considered in conflict with the definition. The Committee made further amendments, to align with the WHO guidance, to section 9.6.2.4 to emphasize that the product was not similar to breastmilk; and to section 9.6.4 to indicate that the product should be distinctly labelled to ensure that consumers could distinguish between infant formula, follow-up formula for older infants and [product] for young children, and foods for special dietary uses. In addition, a statement that cross-promotion was not allowed on the label was also introduced. Some delegations were not in favour of a provision on cross-promotion and raised concerns on whether it included advertising and marketing and that it went beyond the mandate of this Committee. The Chair confirmed that any reference to cross-promotion should be in relation to the label of the A suggestion was made to refer to cross-promotion on labelling rather than label. A question was then asked whether the term labelling extended to marketing and advertising. The Codex Committee on Nutrition and Foods for Special Dietary met in Berlin from 24th -30th November. CLICK HERE for a report on what happened last year. IBFAN and partner NGOs focused on the issues that relate to infant and young child feeding – thee key isses. WHO INFORMATION NOTE – Clarification on the classification of follow-up formulas for children 6-36 months as breastmilk substitutes. This is an important paper that provides the rationale for WHO’s position that breastmilk substitutes include any milks of products that could be used to replace milk that are specifically marketed for feeding infants and young children up to the age of 3 years. Comments at Step 3 on Scope, Product Definition, Labelling. Comments at Step 6 on Essential Composition. Formulas for babies 6-36 months are big business and there was global media coverage following the position taken by the United States at the 71st World Health Assembly this May. At the Codex Commission meeting in Rome in July there was yet more evidence of the hard line being taken by the US to protect corporate interests and the routine use of antibiotics and growth hormones in livestock. These issues affect the health of us all, but are especially important for children. The promotion of formulas for older babies is fuelling global formula sales (set to rise to $70bn by 2019) and exacerbating the obesity epidemic – while undermining breastfeeding – a lifeline for so many children and undermining the health safeguards that exist in many countries. The key consideration will be the definition. WHO, IBFAN and all our partners are clear that these products function as breastmilk substitutes and their labelling and marketing must properly controlled in line with the International Code and all subsequent relevant WHA Resolutions and that specific reference is made to the 2016 Resolution (WHA 69/9) and the Guidelines on Ending the inappropriate Promotion of Foods for infants and Young Children. Proposed draft Guidelines for Ready-to-Use Therapeutic Foods. IBFAN is concerned that this issue was brought to Codex where commercial interests are so dominant. We will be working to ensure that these products are not marketed and pushed as THE solution to malnutrition, and that support for more culturally appropriate and sustainable family foods and continued breastfeeding is not undermined. There are many unresolved problems with the products related to safety, composition (RUTF currently contain 25% sugar), production, transportation, distribution and of course marketing. There will be a Physical Working Group to discuss the Preamble of this Guidelines on Saturday 24th November 2018. Proposed draft definition for biofortification, Comments at Step 3 Deadline 25th October 2018. IBFAN 2018 BIO COMMENT. Foods for Special Medical Purposes (FSMP) are specialist foods intended for the exclusive or partial feeding of people whose nutritional requirements cannot be met by normal foods. The Department of Health and Social Care is seeking views on plans to introduce domestic legislation, in the form of an amending Statutory Instrument (SI), so that EU Regulation 2016/128 on food for special medical purposes can be enforced in England. We are asking for stakeholders’ views on the appropriateness of the proposed approach to enforcement, which is based on Improvement Notices. The SI to be amended for England is the Food for Specific Groups (Information and Compositional Requirements) (England) Regulations 2016, SI 2016 No. 688. This is a limited technical consultation; the list of consultees is at Annex A. The informal consultation will start 20th September 2018 and end 18th October 2018. Responses should be submitted to nutritionlegislation@dh.gsi.gov.uk by 5pm on 18th October 2018. • explicit contribution to reaching the UN Sustainable Development Goals and the WHO targets on non-communicable diseases. The submission deadline is 31 August 2018. IACFO supports IBFAN’s position that all products that function as breastmilk substitutes should come under one standard to ensure that all the products are labelled and marketed, including the prohibition on cross branding, to. prevent the risks of misuse, needless use and confusion. There was no consensus agreement that Option 4 should dropped. Safeguarding child health and limiting the harmful labelling and marketing of these products should be the highest priority for Codex. Baby Milk Action/IBFAN UK comments on this consultation. In February we submitted comments to WHO outlining our concerns about the status of this Commission and three of the proposed Commissioners, most worryingly Arnaud Bernaert, from the World Economic Forum. These Commissioners all have an ‘advisory’ role on the Commission, throwing into question the status and role of Member States. Despite consistent reassurances that WHO’s policy-setting functions would be protected from commercial influence, our concerns were not taken up and, as we feared, the report blatantly promotes Public Private Partnerships and other business friendly strategies as essential to the success of NCD responses in all countries, with little or no acknowledgement of the risks. Click here for Background Documents on the WHO website. Click here for what we did at the Executive Board meeting in January. CLICK HERE for IBFAN’s EB comments on this subject. CLICK HERE for Baby Milk Action’s submission. In response to the call for comments on WHO’s proposals for an Independent Global High-level Commission on NCDs we sent comments outlining our concerns about the appropriateness of three of the proposed Commissioners, who will have an ‘advisory’ role: Arnaud Bernaert, World Economic Forum; Dr Sania Nishtar and Katie Dain of the NCD Alliance. Since our concerns were not taken up we are asking further questions about the “DUE DILIGENCE” criteria used to determine who is accepted and the transparency of the whole processes. CLICK HERE and HERE for model letters to MPs. EFSA has launched an open consultation on its draft protocol for the Scientific Opinion on free sugars from all dietary sources. This draft protocol describes the methodology that the EFSA Panel on Nutrition, Dietetic Products and Allergies (NDA Panel) will apply to address the request to define a science-based cut-off value for a daily exposure to free sugars from all dietary sources that is not associated with adverse health effects. This mandate was received from the national food authorities of five European countries (Denmark, Finland, Iceland, Norway, and Sweden), and it is expected to be finalised by February 2020 with the publication of the EFSA Scientific Opinion on free sugars from all dietary sources. IBFAN is in Official Relations with WHO and will have a team at the forthcoming Executive Board Meeting CLICK HERE for some key submissions IBFAN has made about WHO’s Framework of Engagement with Non State Actors and the redefining of Conflicts of Interest. The Executive Board is composed of 34 members technically qualified in the field of health. Members are elected for three-year terms. The main functions of the Board are to give effect to the decisions and policies of the World Health Assembly, to advise it and generally to facilitate its work. The draft of the 13th Programme of Work was discussed at a special Executive Board Meeting at WHO HQ on 22-23rd November. UK-US trade relations inquiry launched Deadline 17th November. The deadline for written submissions is Friday 17 November 2017. Written evidence should be submitted via the UK-US trade relations inquiry page. The International Trade Committee launches an inquiry into UK-US trade relations. This will pick up on the previous Committee’s work, brought to an end by the 2017 election, examining the opportunities and challenges in negotiating a free trade agreement and increasing trade between the two countries. The Committee encourages those who did not send submissions to the previous inquiry to submit evidence to this one. Individuals and organisations that did submit evidence to the previous Committee’s inquiry do not need to re-send their submissions, as that evidence can continue to be considered in this inquiry. This Committee would, however, welcome additional evidence from these stakeholders if they would like to submit an updated view. IBFAN’s Codex Working Group has prepared a briefing paper to highlight our recommendations for the revision of the Codex Follow-up Formula standard (Codex Stan 156-1987) at the 39th Codex nutrition meeting to be held in Berlin, 4-8th December. to highlight our concerns that the proliferation of standards risks increased trade and marketing of unnecessary and risky products. to ensure that formulas targeting babies 6-36months are noted as being unnecessary, that all are Breastmilk Substitutes and all come under the scope of the International Code and subsequent relevant WHA resolutions and should not be promoted. 3 The Proposed draft Definition for Biofortification. Despite its laudable aims, IBFAN has many concerns about this plan, and we hope the consultation will lead to its improvement. In seeking to align WHO more closely with the Sustainable Development Goals (SDGs) and become more ‘ operational’ there is no mention the harm caused by marketing, Conflicts of Interest, the need to protect WHO’s integrity independence and credibility, or how inappropriate funding can distort and influence outcomes and impact. There is no mention of the difference between the objectives and duties of WHO and its Member States and those of the Private Sector (including Transnational Corporations, who have a duty to maximise profits). The only safeguard offered seems to be the deeply flawed FENSA which is presented as an ‘enabler of responsible partnerships‘. The section Providing the world’s Governance Platform for Health is particularly worrying and seems to promote the idea that private sector entities and philanthropic foundations could actually be involved in governance: “At the same time, it is recognized that global governance has evolved from intergovernmental governance alone, and WHO is also an emerging platform for multi-stakeholder (i.e. government, nongovernmental organizations, private sector entities, philanthropic foundations and academic institutions) governance” (p8 Para 3). You may find other problems related to your field of expertise/activism. Here is the comment from IBFAN. http://www.who.int/nutrition/consultation-doi/en/ or in Nutrition webpage http://www.who.int/nutrition/en/ . The 40th CODEX ALIMENTARIUS COMMISSION (CAC) will start tomorrow in Geneva. The Global Food Standards set by Codex are important because they are used as bench marks in the event a Trade Dispute. IBFAN and IACFO have been attending Codex meetings for over 20 years with the aim of achieving Policy Coherence between WHO and Codex: it is helpful to governments who want to protect child health if Codex Standards are in line with WHO Policy and the Resolutions adopted the World Health Assembly. The industry argument that a ‘History of Safe Use‘ is sufficient was challenged by the European Food Safety Authority (EFSA) in May in its final guidance on the assessment needed for food for babies under the age of 16 weeks. Following a consultation EFSA maintains the requirement for an extended one generation reproductive toxicity study for substances added intentionally to infant formula. Codex revision of the Follow-up Formula Standard. The Background paper for the consultation states: It should be noted that at CCNFSDU38, the Codex Secretariat noted that it was possible to keep the matter open on the final form and structure of the Standard. This could include one Standard in two parts (as is currently being worked on by the eWG), two separated standards, or merging with other standards. IBFAN is proposing as the best option that all formulas 0-36 months are brought under a revised and renamed Infant Formula Standard. We believe that one over-arching standard – with 3 or 4 sections – will help regulators and policy makers bring in the safeguards on the composition, safety, labelling and marketing that are needed to prevent misleading marketing and unsafe products. That Infant formula can be used from birth until 12months and beyond. That the Int Code,Global Strategy and all WHA Resolutions are mentioned with key resolutions and the Guidance highlighted alongside specific key sections. These expensive sweetened and flavored milks (called ‘follow-on milks’, ‘growing-milks’ ‘toddler milks’ etc) share branding with infant formulas from birth and are driving the formula market – a market set to rise by 55% from US$45 billion to US$70 billion by 2019. The aggressive marketing of these products is not only misleading parents, undermining national health messages and risking child health and survival, but exacerbating the obesity epidemic. (2) Infant formula can be used from birth to 12 months and beyond, so these products are not necessary and this should be clearly stated in Codex standards. 2 For example, Nestlé’s promotion to health professionals in Botswana of its “First acidified ‘growing-up milk’ in Southern Africa” Pelargon 3 – uses unsubstantiated claims that it: reduces the risk of infection from: Dirty water; Child Minding/Day care; Exposure when travelling and Exposure in warm, wet seasons. IBFAN’s comments on the second consultation submitted June 2017. RUTF products should not be available, sold or promoted on the open market. RUTF products are for therapeutic purposes. Inappropriate marketing can result in unnecessary use with loss of confidence in local family foods and sustained breastfeeding. It is critical that these products be used in compliance with the International Code and relevant subsequent WHA resolutions and the Guidance on inappropriate marketing of foods for infants and young children. RUTF should not be cross promoted with Breastmilk Substitutes and should carry no promotional or idealising claims or pictures. IBFAN and IACFO support the use of local foods to develop culturally suitable and nutrient rich RUTFs and that national authorities are best to provide solutions to address the treatment of SAM. The Guidelines must state that National authorities retain the ability to provide national solutions and prevent unnecessary imports of expensive RUTF products. To advocate for national positions to safeguard the appropriate use for RUTF contact your national Codex Contact Points (these can be accessed at http://www.fao.org/fao-who-codexalimentarius/members-observers/members/en/?no_cache=1) or other relevant policy makers. It should be noted that at CCNFSDU38, the Codex Secretariat noted that it was possible to keep the matter open on the final form and structure of the Standard. This could include one Standard in two parts (as is currently being worked on by the eWG), two separated standards, or merging with other standards. The Name of the Standard should be amended to reflect the approach that is determined and align with the name of the product(s) included. Until the final form and structure is determined, and the Name of Product(s) finalised, the Chairs suggest deferring a decision on the Name of the Standard. Agenda Item 14.3 Engagement with non-State actors. IBFAN is one of WHO’s longest-standing partners. Our work since Halfden Mahler’s time – has centred on WHA Resolutions that have saved countless infant lives. IBFAN is anxious that WHO emerges from the FENSA process as the lead agency in public health, able to fulfill its constitutional mandate and not be relegated a limited role in a ‘multi-stake-holderised’ global health architecture. Through ill-defined terms such as ‘partnership’ ‘stake-holder’ and ‘trust’ corporations claim the right to participate in public health decision-making processes, sidelining governments, the UN and peoples’ human rights. Despite this, FENSA was adopted – with promises of due diligence and increased transparency, and that WHO would “exercise particular caution…when engaging with private sector entities …whose policies or activities are negatively affecting human health..” The DG report further promotes this notion. The report was presented to Member States too late for us to comment before the meeting of WHO’s Programme Budget and Administration Committee meeting (as Dr Chan called for many times). The first five applications for Official Relations are a test of its thoroughness. The Gates Foundation application is an example that has prompted a new letter to the EB from 35 organisations. That the Foundation has made substantial contributions to WHO and many health initiatives is matter of public record. That it might have an influence on WHO’s nutrition policy setting– for good or for bad – we make no judgement here – is also no secret. The FENSA process could have provided clarity on the relationship between WHO and the Foundation. This opportunity has been lost, and public trust that the process will tackle the task ahead properly has been severely damaged. We ask that the Gates decision be delayed, ‘stakeholder’ defined and FENSA reviewed and evaluated as soon as possible and that WHO is provided with adequate, untied funding to carry on its essential. Now the GCM proposes an annual self-reporting mechanism for NSAs that we believe will mislead the public and policy makers alike. Although it is welcome that NSAs are ‘encouraged’ to submit only actions within their core area of business, spurious marketing strategies masquerading as health initiatives could be registered and so gain credibility from the image transfer from WHO. The baby food industry hi-jacking of World Breastfeeding Week, is just one example. The promotion of voluntary – here today, gone tomorrow – initiatives, can also undermine government resolve to bring in effective legislation. Since WHO states that it does not have the capacity to ‘quality assure’ all activities and guarantee that they are in conformity with WHO policy, this idea should be abandoned. It is far too risky. Last, we call on WHO to be consistent in its messaging. On the one hand WHO emphasises micronutrients – on the other, it encourages consumption of fresh fruit, vegetables and minimally processed, bio-diverse foods and of course, breastfeeding. Over-emphasis on single nutrients opens the door to idealising health and nutrition claims on less healthy processed products. The public meanwhile is unaware that high heat processing and storage can destroy essential nutrients in these products. You could stare at a banana all day and not see the nutrients it contains. Whereas a glance at a package laden with nutrition claims immediately inspires confidence. IBFAN participated in the development of the ECHO Report and is pleased that many of our comments were taken on board, in particular the recognition of the importance of breastfeeding and appropriate complementary feeding in obesity prevention. As you know, States obligations with regard to breastfeeding are defined in the 3-pillar framework ‘Protect, Promote and Support’ adopted in 2002 by the WHA. Recently, a group of UN experts, among whom the Special Rapporteur on the Right to Health and the Committee on the Rights of the Child, have reiterated that these obligations, including protection against misleading marketing, constitute an integral part of States’ human rights obligations. Mothers themselves have no obligation to breastfeed their child. Indeed, they always remain fully sovereign over their own body. It is rather the role of States to ensure that mothers do not face obstacles to breastfeeding. States have the obligation to provide mothers with accurate and unbiased information and counseling from the start of their pregnancy, including on the continuation of breastfeeding up to 2 years or beyond. We regret that key factor, is not mentioned in Action 4. The Baby Friendly Hospital Initiative should also be mentioned as the external audit that guarantees implementation of the Ten Steps. To be consistent with the recommendation to exclusively breastfeed up to 6 months, States should grant working mothers with a minimum of 6 months of maternity leave. IBFAN is the global network that protects breastfeeding and works for policy coherence with WHO’s Resolutions. Our work is especially important in emergencies, where responses are often characterized by influxes of unsolicited donations of all manner of baby feeding products – donations that can often do more harm than good. Breastfeeding is a lifeline for infants and young children in emergencies, has zero environmental impact, and States have a human rights obligation to ensure that mothers are enabled to make an informed decision on infant feeding, free of conflicts of interests. Yet, breastfeeding is often forgotten or badly managed. Meanwhile, media reports show starving babies and rarely question why they are not breastfed. IBFAN’s World Breastfeeding Trends Initiative assessment of policies and programmes on Infant feeding during emergencies show that implementation of UN recommendations on this is dismal. WHO – as a norm-setting, rather than implementing agency – can play a key role in reversing this situation by promoting emergency preparedness protocols that aim to improve food security in the long term. Such actions could even be opportunities for public health generally. We know emergencies prompt philanthropy, but they are also opportunities for commercial exploitation and the Business of Malnutrition. While the speedy delivery of products can be essential in certain circumstances, emergency relief protocols must prevent over-emphasis on product-based, quick-fix approaches to the treatment of malnutrition, approaches that can undermine confidence in breastfeeding and sustainable, local, bio-diverse foods. If breastmilk substitutes are required they must be purchased, distributed and used according to the UN’s agreed strict criteria. Training is essential – to support breastfeeding, of course, but also to minimize the risks of artificial feeding for non breastfed children, whilst ensuring that breastfeeding is not undermined. We look forward to continuing work with WHO on this important issue. CODEX – URGENT issues to be discussed at the 38th Session of the Codex Committee on Nutrition and Foods for Special Dietary Uses in Hamburg, Germany, 3-9th December 2016. IBFAN, IACFO, ENCA and ILCA will be attending and have sent comments to the Electronic Working Groups (EWG) on RUTF, Follow-on Formulas and Bio Fortification. Lack of Policy Coherence between WHO and Codex IBFAN is concerned that Codex’ weak Conflict of Interest safeguards leaves it wide open to undue commercial influences from the food and related industries and their front groups – who often constitute 40% of Codex nutrition meetings, funding dinners and receptions for participants, promoting the findings from industry-funded research. When deciding on the safety of ingredients, additives etc. Codex often refers to ill defined terms such as ‘generally accepted’ ‘History of safe use ‘ ‘science­‐based’ ‘scientifically demonstrated’ rather than the terms recommended by WHO: “Relevant convincing / generally accepted scientific evidence or the comparable level of evidence under the GRADE classification ” this is the underlying factor behind the struggle we have at Codex. We are pleased that the need for Policy Coherence was discussed at the Codex Commission in July, following on from the calls at the 69th World Health Assembly in May 2016. The 1987 Follow-on Formula (FUF) standard established a market for these unnecessary and potentially risky products. WHO has clarified that all formulas for children 12-36 months function as breastmilk substitutes so are covered by the International Code and WHA Resolutions and should not be promoted. IBFAN and WHO and many developing countries have called for these products to be included into the infant formula standard – the baby food industry, and the producer Member States wants separate standards. The fact that Codex went against the advice of WHO demonstrates its failure to put consumer protection first and the urgent need for coherence between Codex and WHO Policy. This issue was on the agenda of the Codex Commission in July, following on from the calls at the 69th World Health Assembly in May 2016, IBFAN is calling on all Governments to call for a strengthening of Codex’ Governance and Conflicts of Interest rules. it suggesting that increasing one or two nutrients in a food, such as golden rice or sweet potatoes, can alleviate malnutrition. It may impact negatively on biodiversity. The use of herbicides, such as glyphosate, can create super weeds and have negative health impacts. Genetically modified food production is patented and its seed use is restricted. It is not a sustainable means for food production and can increase costs to farmers. The Draft Implementation Plan guiding further action on the recommendations included in the Report of the Commission on Ending Childhood Obesity is open for consultation. The purpose of this consultation is to gather feedback on the Draft Implementation Plan for the recommendations of the Commission on Ending Childhood Obesity from Member States and other interested parties. The comments received will be taken into consideration as the document is revised prior to submission to the 140th session of the Executive Board. Please send feedback on the Draft Implementation Plan to echo@who.int before 12 October 2016. EFSA has launched an open consultation on its draft scientific and technical guidance for the preparation and presentation of a health claim application. This document presents a common format for the organisation of information for the preparation of a well-structured application for authorisation of health claims which fall under Articles 13(5), 14, and 19 of Regulation (EC) No 1924/2006. This guidance outlines: the information and scientific data which must be included in the application, the hierarchy of different types of data and study designs (reflecting the relative strength of evidence which may be obtained from different types of studies) and the key issues which should be addressed in the application to substantiate the health claim. In July 2016 the EU Commission launched a consultation with Member States asking whether health claims should be permitted on formulas and baby foods. Codex Guidelines for Ready to Use Therapeutic Foods (RUTF) 2nd round of comments (submitted 23rd June 2016). SECOND CONSULTATION PAPER ON GUIDELINE FOR RUTF:. There were many important issues on the agenda of the CAC – including Antimicrobial Resistance, Lead Levels, rBST. But perhaps most importantly for IBFAN, and following on from the calls at the 69th World Health Assembly in May 2016, there was a discussion about the need for policy coherence between Codex and WHO policies. Please encourage your governments to call for a strengthening of Codex’ Governance and Conflicts of Interest rules. 137. The Chairperson presented the conclusions of CCEXEC7152 and noted that CCEXEC had not been in a position to discuss the item in detail due to the late availability of the document. 138. Several delegations thanked the parent organisations for initiating this discussion, acknowledging that there was a need to ensure awareness of FAO and WHO policies and guidelines at the national level when coordinating positions for Codex. It was also stressed that the mandate of Codex differed from that of FAO and WHO, meaning that issues raised by FAO and WHO would be taken into consideration when relevant to Codex work. They noted that existing mechanisms for communication generally worked well. 139. The Representative of WHO referred to the discussion at CCEXEC7153 and recalled that over the past ten years the WHA had made several requests to Codex to strengthen its work in supporting public health efforts. Simultaneously WHA had encouraged Member States to use Codex standards and guidelines to protect and promote human health, the latter being the common mandate of WHO and Codex. 140. The Representative noted that there were challenges in discussions at WHA concerning the use of Codex standards and guidelines at the national level and their reputation at the international level. These challenges were linked to the fact that Codex standards and guidelines were not always developed taking into account WHO policies, strategies and guidelines aimed at addressing the high-priority public health concerns of Member States such as obesity and diet-related noncommunicable diseases (NCDs). 141. The Representative noted further that the need for Codex to fully take into account the WHO policies, strategies and guidelines had been raised at CAC38 by Papua New Guinea as the Chair of CCNASWP54. The document recommended that Codex take action to reduce salt/sodium intake to control NCDs (as recommended by the NCD Action Plan 2013–2020 adopted by WHA in 2013), through developing maximum levels of sodium contents in selected food products. The matter could not be discussed at CAC38 due to lack of time. 142. The Representative further recalled the status of Codex as an intergovernmental body operating under the auspices of FAO and WHO. This status permitted adopted Codex standards to be published with the FAO and WHO emblems. This privileged status of Codex underscored the need for coherence between the work of Codex and WHO policies, strategies and guidelines which Codex members, as WHO Member States, had signed up to. Codex could only benefit from demonstrating to the governing bodies of WHO greater coherence of its standards with WHO policies, strategies and guidelines, which in turn would help secure ongoing financial and technical support from WHO to the work of Codex. The Representative recommended that the Commission take practical steps forward as described in paragraph 15 of CX/CAC 16/39/11. 143. The Representative of FAO thanked the members for their reflective and considered feedback and apologised for the late availability of the working document. She noted that the interventions had demonstrated a high level of awareness of the relevance of FAO and WHO policies to the work of Codex and a recognition of the importance of these policies being fully considered in carrying out the standard-setting work of Codex. She agreed with the observations made by countries that, in many cases, there was a need for better communication at national level to engage all relevant stakeholders in discussions of Codex issues. She considered, however, that the examples and analysis contained in the working document had demonstrated some scope for improving systematic and effective communication at global level as well. She underlined that while Codex existed under the umbrella of FAO and WHO, the substantive standard-setting work of Codex was member driven: it was the Commission’s decision which standards to set. She concluded by noting that administrative matters related to the Codex Secretariat were governed by the relevant FAO rules and procedures in accordance with the Codex Statutes. (v) Codex has always given due consideration to relevant policies, strategies and guidelines in undertaking its work being thereby enabled to make informed decisions. 145. The Commission proposed to CCEXEC to further discuss the working document at its 73rd session; noted the need to increase the visibility of Codex in WHO governing bodies, and noted the proposal by IFPRI for Codex to organize side events at WHA. Committee on Nutrition and Foods for Special Dietary Uses (CCNFSDU) Guideline for Ready-to-Use Therapeutic Foods (RUTF)41 Paragraghs 102 – 107. 102. The Commission noted the wide support for this new work especially in view of the fact that there was a need for guidance for governments and producers on RUTF used in the management of severe acute malnutrition (SAM). Delegations indicated that these products were already produced in some of their countries and/or used in the management of SAM not only in refugee populations, but also for malnourished infants and geriatrics and thus the guidance would be helpful. 103. The Delegation of India did not support the proposal due to the lack of sufficient scientific data in favour of using RUTF in the management of SAM in community settings and noted that the review from WHO on the safety and efficacy of using this product was not yet available. 104. The Representative of WHO explained that the ongoing systematic reviews, which WHO was undertaking, would not develop guidance on the nutrient composition of RUTF. WHO was more comfortable with the proposal now as it no longer included ready-to-use supplementary foods (RUSF) for which there was little evidence of their effectiveness in the treatment and prevention of moderate acute malnutrition. 105. She also noted that FAO and WHO had worked closely with UNICEF to provide this proposal for consideration to CCNFSDU and supported this new work to go ahead. 106. Noting the clarification from WHO, India expressed support for the new work. 107. The Commission approved the new work. The failure of Codex to include and implement adequate and effective Conflict of Interest safeguards means that its norm setting procedures (and its guidelines for National Codex Committees and National Codex Contact Points) are wide open to undue commercial influences from industry and its front groups. Often 40% of delegates at Codex nutrition meetings are from the food or related industries. These companies regularly create situations that give rise to conflicts of interest by funding dinners and receptions for participants, promoting the findings from industry-funded research and contributing to secretarial services – a conflict of interest in itself. When deciding on the safety of contaminants, ingredient, additives etc. Codex refers to ill defined terms such as ‘generally accepted’ ‘History of safe use ‘ ‘science­‐based’ ‘scientifically demonstrated’ rather than the terms recommended by WHO: “Relevant convincing / generally accepted scientific evidence or the comparable level of evidence under the GRADE classification ” Electronic Working Groups arrive at decisions on the basis of consensus rather than evidence. 1 Codex Guidelines for Ready to Use Therapeutic Foods (RUTF) The deadline for the 2nd round of comments on RUTF is 23rd June. IBFAN and IACFO have submitted comments to the Codex Electronic Working Groups on Ready to Use Therapeutic Foods (RUTF) and this paper: SECOND CONSULTATION PAPER ON GUIDELINE FOR RUTF:. This is a controversial issue. IBFAN and many developing countries maintain that a Codex Standard (or Guideline) is not needed for these products. While RUTFs can be useful in the treatment of Severe Acute Malnutrition (SAM) their use must be integrated into sustainable, local, family based solutions, that also help build health care systems. Codex instruments are designed to break down barriers to trade and boost trade. In this context there is a risk that they will encourage emphasis on single product approaches that ignore the underlying causes of malnutrition and that resources will be diverted away from training on breastfeeding and appropriate complementary feeding. It is essential that Governments strictly control the promotion, labelling, availability and safety of these products. 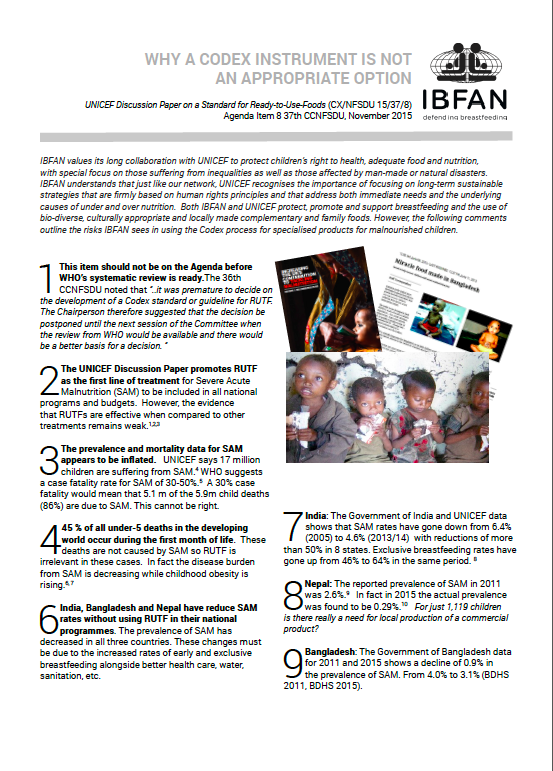 At the last meeting of the Codex Nutrition Committee (CCNFSDU37, Nov 2015) the decision was taken to establish an eWG, led by South Africa and co-chaired by Senegal and Uganda, to develop Guidelines for these products for babies suffering from Severe Acute Malnutrition (SAM). used only under the strict medical supervision of an independent health worker. that all provisions of the International Code or WHA Resolutions are included in the Guidance. IBFAN is attending the 69th World Health Assembly – and covering several issues. 20 May 2016 -Draft resolution – Nutrition. At the request of a Member State, the Secretariat will report on the implications of the Paris Agreement, adopted in December 2015 by the twenty-first session of the Conference of the Parties to the United Nations Framework Convention on Climate Change (Paris, 30 November−11 December 2015), and on its plans to scale up support to Member States on: health resilience to climate risks; linking climate change, air pollution, and sustainable development; and systematic measurement and reporting of country progress to global health and climate change governing bodies. REPLACE WITH: Require Codex standards and guidelines to be coherent with all WHO guidelines and recommendations, including the International Code of Marketing of Breastmilk Substitutes and subsequent relevant WHA resolutions. Work continues on the Review of the Follow-on Formula (FUF) standard that was adopted in 1987 and has done much harm. IBFAN and WHO and several Member States have been calling for consideration to be given to whether the standard is needed at all, given that the products are not necessary, and could be brought into the Infant Formula Standard. Any the compositional differences from infant formula could easily be addressed in footnotes. The important thing is to bring the marketing in line with WHO Policy – i.e. the International Code and subsequent relevant WHA Resolutions. The baby food industry, and Member States that support the growth in this market, argue that a separate standard is necessary. The fact that CCNFSDU went against the advice of WHO demonstrates the failure of Codex to put the consumer protection first. The Submitters response form asks for comments on the composition of FUF and formulas for babies 12-36 months. (so called Growing up milks) The eWG still is not addressing marketing. Biofortification deadline 7th April. Zimbabwe and South Africa are chairing the Codex eWG team that is reviewing the First Consultation Paper within the timeline: 29 March to 29 April 2016. Comments requested by the 7th of April. (Click here for IBFAN comments for the November meeting. IBFAN is concerned that this paper will help legitimise genetic modification. We are opposed to using generic terms such as “agricultural methodologies” which hide the true means of production and mislead consumers. We are also concerned about the impact of biofortification on biodiversity which can negatively effect dietary diversity and nutrition intakes. You can send any comments or queries on the register to the Transparency Register Joint Secretariat at http://ec.europa.eu/transparencyregister/public/staticPage/displayStaticPage.do?reference=CONTACT_US. Entry into force and application: This Regulation shall enter into force on the 20th day following that of its publication in the Official Journal of the European Union. It shall apply from 22 February 2020, except in respect of infant formula and follow-on formula manufactured from protein hydrolysates, to which it shall apply from 22 February 2021. For the purposes of the second subparagraph of Article 21(1) of Regulation (EU) No 609/2013, in respect of infant formula and follow-on formula manufactured from protein hydrolysates the later date referred to in the second paragraph of this Article shall be considered as the date of application. We invite you to forward this message to any other parties which could be interested in this initiative including your members, clients or partners, if you have any. The Draft resolution and the Guidance contain some provisions that we warmly welcome as they are likely to contribute to the much needed increase in rates of optimal infant and young child feeding (Lancet 2016). One such provision is the needed clarity that formulas for older babies (up to 36 months) are covered by the International Code and WHA Resolution. However, there are some serious concerns that Member states must address before adoption of this important Resolution and its Annex at the 69th WHA in May. We highlight these below and urge Member states to present these to the WHO Secretariat so that the new draft reflects them adequately. Codex: Draft Resolution Op2 d and Recommendation 3 of the Guidance The recommendation to implement Codex Guidelines and Standards into national law poses a serious risk to health. Codex standards and guidelines be must be brought fully in line with WHO guidelines, resolutions and recommendations before they are implemented into national legislation. As currently drafted the MIYCN Resolution and Guidance would undermine hard won, health protective norms already adopted by the WHA. Although IBFAN has achieved some strengthening of Codex standards and guidelines relating to products for babies, the lax/non existent conflict of interest rules of Codex have led to compromises. The Resolution specifically mentions the Codex Guidelines on formulated complementary foods CAC/GL 8-1991, which along with many other Codex texts does not fully reflect WHA Resolutions and Recommendations and are less health protective than many national laws. Codex is currently discussing the revision of the Follow-on Formula Standard and guidelines on Ready to Use Therapeutic Foods. The food industry is fighting hard to oppose the inclusion of important marketing safeguards. Strong guidance from the WHA is needed to inform this work and help Member States harmonize Codex texts with WHA recommendations. B Annex: Guidance on ending the inappropriate promotion of foods for infants and young children Paragraph 3 creates a loophole that could lead to further increase of inappropriate marketing of fortified foods and supplements, rather than to the adequate oversight of their use. Recommendation 4 opens the door to marketing by listing PROMOTIONAL strategies that MAY BE CONVEYED. This defeats the intent of WHA Resolution 65.6 that simply called on the DG: to provide clarification and guidance on the INAPPROPRIATE promotion of foods for infants and young children. There is therefore no justification for the inclusion of a shopping list of marketing strategies. If adopted such a list would undermine legislation that is in effect in many countries such as India, Kenya, Bangladesh, South Africa etc. Any reference in the Guidance that could imply that certain ‘promotions’ are endorsed by the WHA, should be replaced with terms such as “labeled” “put on sale” ‘traded ‘ etc. the exception on emergencies goes against the WHA 47.5 and WHA 63.23, which provide a clear guidance to member states on planning, implementing and supporting emergency relief operations in infant nutrition. the exception regarding ‘officially sanctioned health programmes’ introduces two problems: First the WHA 47.5 aims as ensuring no free and low cost supplies of products covered by the International Code to any part of the health care system. As the term ‘officially sanctioned health programmes’ is not defined, this exception can lead to violations of the WHA 47.5. It also introduces a loophole which could lead to indiscriminate and harmful use of products under the scope of this Guidance. Finally, this Recommendation is directed to companies who should never be direct providers of their products be it in emergencies or any other programmes. The need for any foods for infants and young children should be assessed by qualified emergency relief staff and products resourced through normal procurement channels. 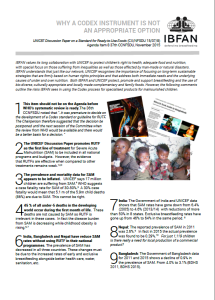 IBFAN Statement on Maternal Child Nutrition 6.1. FENSA: the meeting with April will go ahead. The Maternal Child Nutrition documents will be open for comments in the next 4 weeks. CLICK HERE for the text of the Objection on processed cereal-based food and baby food (ENVI/8/04983) that will be voted on tomorrow – 20th January. Here are our submissions on three agenda items and a quick summary of our concerns . FUF_IBFAN Agenda Item 5 Review of the Standard for Follow-up Formula (FUF) – IBFAN share’s WHO’s view that FUFs and other formulas for older babies (such as the so called Growing Up and Toddler formulas that are sure to be included in the revised FUF standard) are not necessary and their marketing undermines breastfeeding (both before and after 6 months) These products can include flavoured, sweetened and fortified milk products that pose many risks to child health, including childhood obesity. We are advocating that the safety and marketing of products already on the market are dealt with under a renamed Infant formula standard. Agenda Item 6 Biofortification – IBFAN’s position is that the definition must clearly inform consumers that the methods used are conventional plant breeding and genetic modification. We are opposed to using generic terms such as “agricultural methodologies” which hide the true means of production and mislead consumers. We are also concerned about the impact of biofortification on biodiversity which can negatively effect dietary diversity and nutrition intakes. The Draft Final Report of the Commission on Ending Childhood Obesity is now open for comment from relevant stakeholders. In addition, the Commission will hold regional consultations and hearings throughout this consultative period. The Commission reviewed the feedback received on their Interim Report from relevant stakeholders and through the regional consultation. This Draft Final Report proposes key policy actions to address childhood obesity. The Commission welcomes your suggestions and feedback on the Draft Final Report and will consider these, in addition to the inputs received through further regional consultations, in the development of the final report by the end of 2015. The Health Committee is holding a short inquiry, building on the previous Committee’s work on the impact of diet and physical activity on health. This inquiry specifically considers what the Government’s policy priorities should be for addressing childhood obesity. The Committee is not seeking formal written evidence. WTO Techical Barriers to Trade: Opportunity to comment on EU proposals. CLICK here for the papers. The proposals will go to the European Parliament in September. So far the governments of India and Afghanistan and NGOs from Hawaii, UK and Uganda have written, calling for the proposals to be stengthened and brought into line with the International Code and Resolutions. . I attended the informal hearing with NGOs in Official Relations on 17th August. WHO, led by the Department of Nutrition for Health and Development (NHD), launched an online consultation on the discussion paper to solicit comments on the draft clarification and guidance. These comments will be taken into consideration prior to informal dialogue with civil society and private sector (17 August 2015), and informal consultation with Member States (18 August 2015). CLICK HERE for the comments from everyone – including industry – recommendation by recommendation. Baby Milk Action frequently submits comments to consultations on draft regulations and standards. These might come from the UK Government, the European Union or United Nations bodies such as Codex or WHO. Click on the Consultations tag for blog posts on this topic. Failure to address the risks of (and promotion of) the ‘multi-stakeholder’ approaches. Lack of any reference to breastfeeding as a cornerstone of children’s survival, health and development and maternal health or the need for its protection and support. Lack of any mention of the need for governments and UN bodies to have strong Conflict of Interest safeguards in place to ensure that policy setting processes and their implementation is as free as possible from commercial influence. With no references to such safeguards the references to health protection, Human Rights and inequalities are totally undermined – since all are open to exploitation from commercial entities. The uncritical promotion of the involvement of commercial entities is likely to result in significant adverse implications on health and human rights. Inequalities: The GlobalStrategy should explicitly recognise that inequalities are a political issue. Governments should be alerted to the fact that corporations are using Corporate Social Responsibility (CSR) strategies such as Breakfast Clubs, Food banks and ‘nutrition education’ to blur the boundaries with marketing and exploit the poor and vulnerable. For example: Despite the fact that the European Commission has criticised the branding used in Nestlé’s EPODE nutrition education programme the company refuses to stop it, and furthermore has renamed its programme as Epode for the promotion of Health Equity. Towards the development of the Programme on Sustainable Food Systems. FAO’s online consultation Towards the Development of the Programme on Sustainable Food Systems has been extended to 30th April 2015 Please share comments and suggestions on a draft concept note of the Programme and to take part in a stocktaking exercise of initiatives related to sustainable food systems. FAO and UNEP are also collecting expressions of interest to participate in the Programme and become member of its Multi-stakeholder Advisory Committee. The National Institute for Health and Care Excellence (NICE) is developing a public health guideline on Maintaining a healthy weight and preventing excess weight gain among children and adults. This draft guideline is currently out for an 6 week consultation with stakeholders. The consultation on this draft guideline will take place between 23 September – 4 November 2014. The link to the Draft Guideline and the Stakeholder Comments Form for the consultation can be found here http://www.nice.org.uk/guidance/indevelopment/gid-phg78/consultation. IBFAN’s Lida Lhotska delivering an intervention on behalf of Civil Society. The discussions on the Political Declaration were put on hold as some key paragraphs could not be negotiated. The discussions on the Framework for Action go round and round in circles and IBFAN and some public interest NGOs are becoming increasingly frustrated with the process, not least the “watering down” of existing agreements and lack of attention to human rights. There has been much talk of ‘multi-stakeholder ‘ governance mechanisms. We believe that such language opens the door for entirely inappropriate influence from corporations so we are of course opposing such ideas. An example of industry biased language that was agreed: “Recognising that efficient and effective trade is key to achieving nutrition objectives”. However some countries are fighting on. An important intervention was made by Finland, who objected to the proposed recommendation for “the addition of essential nutrients to foods.” Finland said that fortification is only ONE way of improving food content – there are many others – including improving soil quality. Finland’s suggestion was thankfully supported and the wording changed to “improve nutrient content of foods as needed” Not wonderful but better. 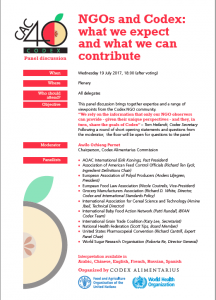 The discussion and some of the comments are available on: http://www.fao.org/fsnforum/forum/discussions/ICN2-FFA CLICK HERE FOR IBFAN COMMENTS FFA_IBFAN_comments. WABA invites YOUR Organisation to enorse and sign-on to this Statement Deadline: 7 November 2014! An FSN forum discussion on the ICN2 Framework for Action (zero) draft to implement the Rome Declaration on Nutrition, is now open for comments and inputs. DEADLINE17th August. Framework for Action. International Conference on Nutrition 2 – The discussion and all the comments so far are available on: http://www.fao.org/fsnforum/forum/discussions/ICN2-FFA CLICK HERE FOR IBFAN COMMENTS FFA_IBFAN_comments IBFAN and many other NGOs are very concerned about the involvement of the Private Sector in the International Conference on Nutrition (ICN2) and we have been taking part in many of the discussions. An FSN forum discussion on the ICN2 Framework for Action (zero) draft to implement the Rome Declaration on Nutrition, is now open for comments and inputs. DEADLINE17th August. Maternal and child nutrition guideline NICE Consultation on the review proposal to consider whether this should be updated. Completed Stakeholder Comments Form must be sent to MCN@nice.org.uk by 5pm on 31st July 2014. The deadline for responses to this consultation was extended to 13 July due to the level of high interest (14000 submissions).